UTC+07:00 is an identifier for a time offset from UTC of +07:00. In ISO 8601 the associated time would be written as 2019-04-20T22:33:50+07:00. Areas in a darker shade use daylight saving time. The base color shows the standard time. It is considered the westernmost time zone in East Asia. Some bases in Antarctica. See also Time in Antarctica. 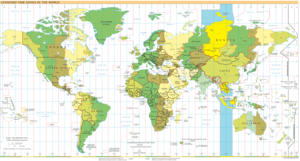 Since legal, political and economic in addition to physical or geographical criteria are used in the drawing of time zones, it follows that official time zones do not precisely adhere to meridian lines. The UTC+07:00 time zone, were it drawn by purely geographical terms, would consist of exactly the area between meridians 97°30′ E and 112°30′ E.
As a result, there are places which, despite lying in an area with a "physical" UTC+07:00 time, actually use another time zone. Conversely, there are areas that have gone for UTC+07:00, even though their "physical" time zone is UTC+08:00, UTC+06:00, or even UTC+05:00. This concerns areas within 97°30′ E to 112°30′ E longitude. Inner Mongolia, including its capital Hohhot. A (western) part Sakha Republic in Russia, including the urban localities Aykhal and Udachny. The westernmost part of Indonesia including most of the province Aceh with its capital Banda Aceh. The easternmost part of Java including East Java's capital Surabaya, Sidoarjo, Malang, and Banyuwangi. The Island Madura and Kangean Islands, which administratively belong to East Java Province. ^ "HOVT – Hovd Time". Asian time zones. Time and Date. Retrieved 14 July 2012.